Matthew Klein has a characteristically thoughtful post disagreeing with my new paper on income distribution and debt. I think his post has some valid arguments, but also, from my point of view, some misunderstandings. In any case, this is the conversation we should be having. I want to respond on the specific points Klein raises. But first, in this post, I want to clarify some background conceptual issues. In particular, I want to explain why I think it’s unhelpful to think about the issues of debt and demand in terms of saving. Klein talks a great deal about saving in his post. Like most people writing on these issues, he treats the concepts of rising debt-income ratios, higher borrowing and lower saving as if they were interchangeable. In common parlance, the question “why have households borrowed more?” is equivalent to “why have households saved less?” And either way, the spending that raises debt and reduces saving, is also understood to contribute to aggregate demand. This conception is laid out in Figure 1 below. These are accounting rather than causal relationships. A minus sign in the link means the relationship is negative. We start with households’ decision to consume more or less out of their income. Implicitly, all household outlays are for consumption, or at least, this is the only flow of household spending that varies significantly. An additional dollar of household consumption spending means an additional dollar of demand for goods and services; it also means a dollar less of savings. A dollar less of savings equals a dollar more of borrowing. More borrowing obviously means higher debt, or — equivalently in this view — a higher debt-GDP ratio. There’s nothing particularly orthodox or heterodox about this way of looking at things. You can hear the claim that a rise in the household debt-income ratio contributes more or less one for one to aggregate demand as easily from Paul Krugman as from Steve Keen. Similarly, the idea that a decline in savings rates is equivalent to an increase in borrowing is used by Marxists as well as by mainstream economists, not to mention eclectic business journalists like Klein. Of course no one actually says “we assume that household assets are fixed or nonexistent.” But implicitly that’s what you’re doing when you treat the question of what has happened to household borrowing as if it were the equivalent of what has happened to household saving. There is nothing wrong, in principle, with thinking in terms of the logic of Figure 1, or constructing models on that basis. Social science is impossible without abstraction. It’s often useful, even necessary, to think through the implications of a small subset of the relationships between economic variables, while ignoring the rest. But when we turn to the concrete historical changes in macroeconomic quantities like household debt and aggregate demand in the US, the ceteris paribus condition is no longer available. We can’t reason in terms of the hypothetical case where all else was equal. We have to take into account all the factors that actually did contribute to those changes. This is one of the main points of the debt-inequality paper, and of my work with Arjun Jayadev on household debt. In reality, much of the historical variation in debt-income ratios and related variables cannot be explained in terms of the factors in Figure 1. You need something more like Figure 2. Figure 2 shows a broader set of factors that we need to include in a historical account of household sector balances. I should emphasize, again, that this is not about cause and effect. The links shown in the diagram are accounting relationships. You cannot explain the outcomes at the bottom without the factors shown here. I realize it looks like a lot of detail. But this is not complexity for complexity’s sake. All the links shown in Figure 2 are quantitatively important. The dark black links are the same as in the previous diagram. It is still true that higher household consumption spending reduces saving and raises aggregate demand, and contributes to lower saving and higher borrowing, which in turn contributes to lower net wealth and an increase in the debt ratio. 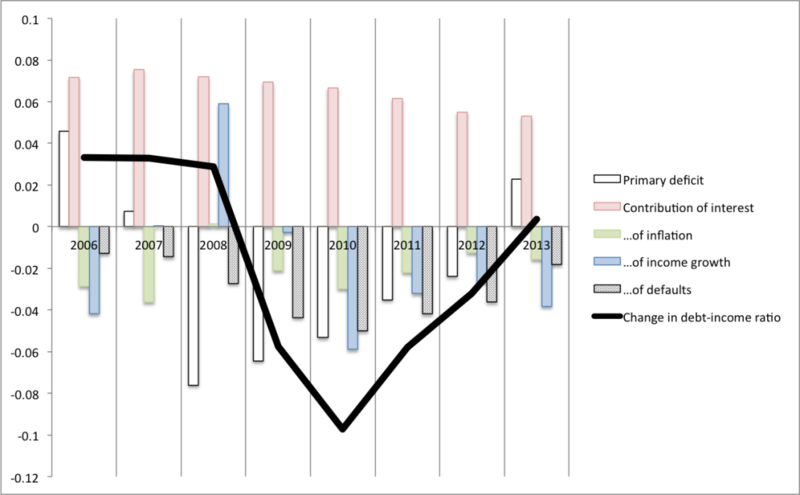 Note, though, that I’ve separated saving from balance sheet improvement. The economic saving used in the national accounts is quite different from the financial saving that results in changes in the household balance sheet. In addition to the factors the debt-demand story of Figure 1 focuses on, we also have to consider: various actual and imputed payment flows that the national accounts attribute to the household sector, but which do not involve any money payments to or fro households (blue); the asset side of household balance sheets (gray); factors other than current spending that contribute to changes in debt-income ratios (red); and change in value of existing assets (cyan). The blue factors are discussed in Section 5 of the debt-distribution paper. There is a much fuller discussion in a superb paper by Barry Cynamon and Steve Fazzari, which should be read by anyone who uses macroeconomic data on household income and consumption. Saving, remember, is defined as the difference between income and consumption. But as Cynamon and Fazzari point out, on the order of a quarter of both household income and consumption spending in the national accounts is accounted for by items that involve no actual money income or payments for households, and thus cannot affect household balance sheets. These transactions include, first, payments by third parties for services used by households, mainly employer-paid premiums for health insurance and payments to healthcare providers by Medicaid and Medicare. These payments are counted as both income and consumption spending for households, exactly as if Medicare were a cash transfer program that recipients then chose to use to purchase healthcare. If we are interested in changes in household balance sheets, we must exclude these payments, since they do not involve any actual outlays by households; but they still do contribute to aggregate demand. Second, there are imputed purchases where no money really changes hands at all. The most important of these are owners’ equivalent rent that homeowners are imputed to pay to themselves, and the imputed financial services that households are supposed to purchase (paid for with imputed interest income) when they hold bank deposits and similar assets paying less than the market interest rate. Like the third party payments, these imputed interest payments are counted as both income and expenditure for households. Owners’ equivalent rent is also added to household income, but net of mortgage interest, property taxes and maintenance costs. Finally, the national accounts treat the assets of pension and similar trust funds as if they were directly owned by households. This means that employer contributions and asset income for these funds are counted as household income (and therefore add to measured saving) while benefit payments are not. These items make up a substantial part of household payments as recorded in the national accounts – Medicare, Medicaid and employer-paid health premiums together account for 14 percent of official household consumption; owners’ equivalent rent accounts for another 10 percent; and imputed financial services for 4 percent; while consolidating pension funds with households adds about 2 percent to household income (down from 5 percent in the 1980s). More importantly, the relative size of these components has changed substantially in the past generation, enough to substantially change the picture of household consumption and income. 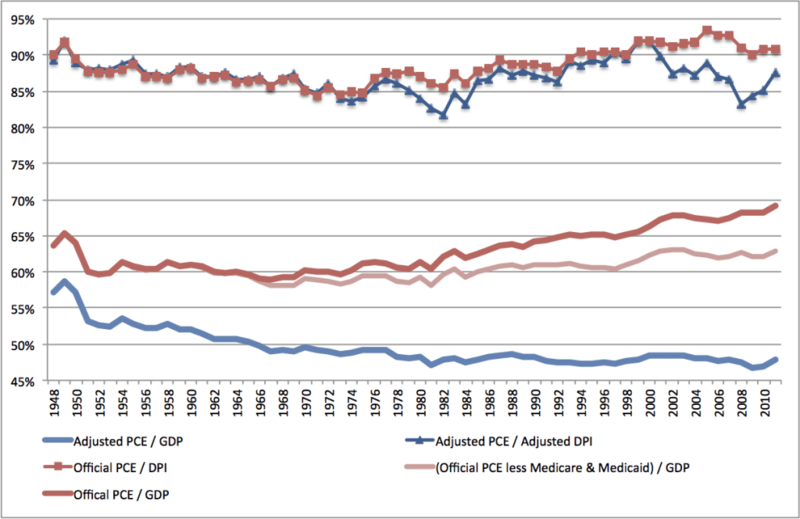 Incidentally, Klein says I exclude all healthcare spending in my adjusted consumption series. This is a misunderstanding on his part. I exclude only third-party health care spending — healthcare spending by employers and the federal government. I’m not surprised he missed this point, given how counterintuitive it is that Medicare is counted as household consumption spending in the first place. The two dotted lines remove public and employer payments for healthcare, respectively, from household consumption. As you can see, the bulk of the reported increase in household consumption as a share of GDP is accounted for by healthcare spending by units other than households. The gray line then removes owners’ equivalent rent. The final, heavy black line removes imputed financial services, pension income net of benefits payments, and a few other, much smaller imputed items. What we are left with is monetary expenditure for consumption by households. The trend here is essentially flat since 1980; it is simply not the case that household consumption spending has increased as a share of GDP. So Figure 3 is showing the contributions of the blue factors in Figure 2. Note that while these do not involve any monetary outlay by households and thus cannot affect household balance sheets or debt, they do all contribute to measured household saving. The gray factors involve household assets. No one denies, in principle, that balance sheets have both an asset side and a liability side; but it’s striking how much this is ignored in practice, with net and gross measures used interchangeably. In the first place, we have to take into account residential investment. Purchase of new housing is considered investment, and does not reduce measured saving; but it does of course involve monetary outlay and affects household balance sheets just as consumption spending does. We also have take into account net acquisition of financial assets. An increase in spending relative to income moves household balance sheets toward deficit; this may be accommodated by increased borrowing, but it can just as well be accommodated by lower net purchases of financial assets. In some cases, higher desired accumulation of financial asset can also be an autonomous factor requiring balance sheet adjustment. (This is probably more important for other sectors, especially state and local governments, than for households.) The fact that adjustment can take place on the asset as well as the liability side is another reason there is no necessary connection between saving and debt growth. Net accumulation of financial assets affects household borrowing, but not saving or aggregate demand. Residential investment also does not reduce measured saving, but it does increase aggregate demand as well as borrowing. 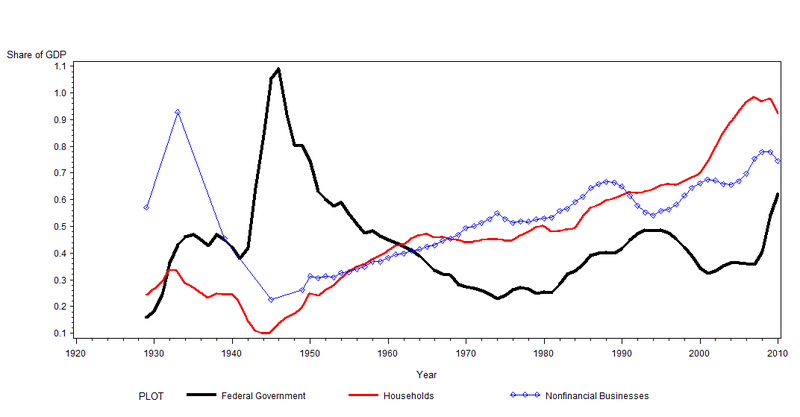 The red line in Figure 3 adds residential investment by households to adjusted consumption spending. Now we can see that household spending on goods and services did indeed increase during the housing bubble period – conventional wisdom is right on that point. But this was a spike of limited duration, not the secular increase that the standard consumption figures suggest. Again, this is not just an issue in principle; historical variation in net acquisition of assets by the household sector is comparable to variation in borrowing. The decline in observed savings rates in the 1980s, in particular, was much more reflected in slower acquisition of assets than faster growth of debt. And the sharp fall in saving immediately prior to the great recession in part reflects the decline in residential investment, which peaked in 2005 and fell rapidly thereafter. The cyan item is capital gains, the other factor, along with net accumulation, in growth of assets and net wealth. For the debt-demand story this is not important. But in other contexts it is. As I pointed out in my Crooked Timber post on Piketty, the growth in capital relative to GDP in the US is entirely explained by capital gains on existing assets, not by the accumulation dynamics described by his formula “r > g”. Finally, the red items in Figure 2 are factors other than current spending and income that affect the debt-income ratio. Arjun Jayadev and I call this set of factors “Fisher dynamics,” after Irving Fisher’s discussion of them in his famous paper on the Great Depression. Interest payments reduce measured saving and shift balance sheets toward deficit, just like consumption; but they don’t contribute to aggregate demand. Defaults or charge-offs reduce the outstanding stock of debt, without affecting demand or measured savings. Like capital gains, they are a change in a stock without any corresponding flow. Finally, the debt-income ratio has a denominator as well as a numerator; it can be raised just as well by slower nominal income growth as by higher borrowing. These factors are the subject of two papers you can find here and here. The bottom line is that a large part of historical changes in debt ratios — including the entire long-term increase since 1980 — are the result of the items shown in red here. First, borrowing is not the opposite of saving. Not even roughly. Matthew Klein, like most people, immediately translates rising debt into declining saving. The first half of his post is all about that. But saving and debt are very different things. True, increased consumption spending does reduce saving and increase debt, all else equal. 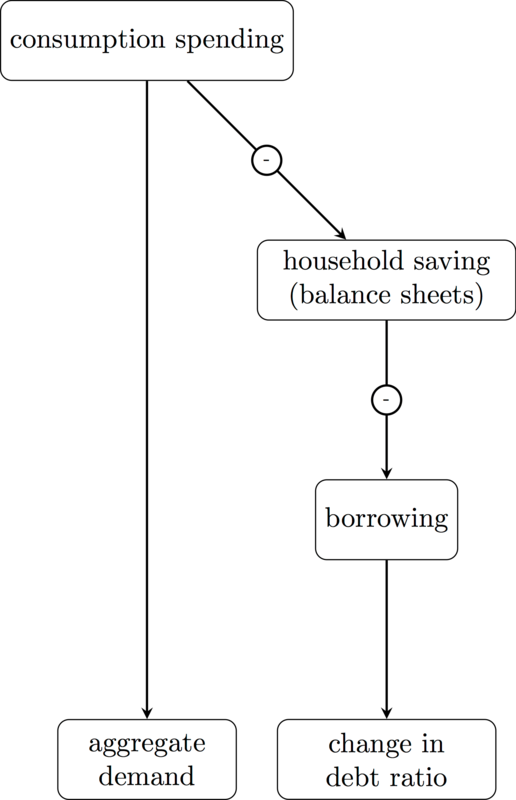 But saving also depends on third party spending and imputed spending and income that has no effect on household balance sheets. While debt growth depends, in addition to saving, on residential investment, net acquisition of financial assets, and the rate of chargeoffs; if we are talking about the debt-income ratio, as we usually are, then it also depends on nominal income growth. And these differences matter, historically. If you are interested in debt and household expenditure, you have to look at debt and expenditure. Not saving. Second, when we do look at expenditure by households, there is no long-term increase in consumption. Consumption spending is flat since 1980. Housing investment – which does involve outlays by households and may require debt financing – does increase in the late 1990s and early 2000s, before falling back. Yes, this investment was associated with a big rise in borrowing, and yes, this borrowing did come significantly lower in the income distribution that borrowing in most periods. (Though still almost all in the upper half.) There was a debt-financed housing bubble. But we need to be careful to distinguish this episode from the longer-term rise in household debt, which has different roots. Think of it this way: If I ask why the return on an investment was 20 percent, there is no end to causal factors you can bring in, from favorable macroeconomic conditions to a sound business plan to your investing savvy or inside knowledge. But in accounting terms, the return is always explained by the income and the capital gains over the period. If you know both those components, you know the return; if you don’t, you don’t. The relationships in the figure are the second kind of explanation. Improvement of existing housing is also counted as investment, as are brokers’ commissions and other ownership transfer costs. This kind of spending will absorb some part of the flow of mortgage financing to the household sector — including the cash-out refinancing of the bubble period — but I haven’t seen an estimate of how much. There’s a strand of heterodox macro called “stock-flow consistent modeling.” Insofar as this simply means macroeconomics that takes aggregate accounting relationships seriously, I’m very much in favor of it. Social accounting matrices (SAMs) are an important and underused tool. But it’s important not to take the name too literally — economic reality is not stock-flow consistent! There are two new papers on the articles page on this site. Both are work in progress – they haven’t been submitted anywhere yet. The first paper, which I presented in January in Chicago, is a critical assessment of the idea of a close link between income distribution and household debt. The idea is that rising debt is the result of rising inequality as lower-income households borrowed to maintain rising consumption standards in the face of stagnant incomes; this debt-financed consumption was critical to supporting aggregate demand in the period before 2008. This story is often associated with Ragnuram Rajan and Mian and Sufi but is also widely embraced on the left; it’s become almost conventional wisdom among Post Keynesian and Marxist economists. In my paper, I suggest some reasons for skepticism. First, there is not necessarily a close link between rising aggregate debt ratios and higher borrowing, and even less with higher consumption. Debt ratios depend on nominal income growth and interest payments as well as new borrowing, and debt mainly finances asset ownership, not current consumption. Second, aggregate consumption spending has not, contrary to common perceptions, risen as a share of GDP; it’s essentially flat since 1980. 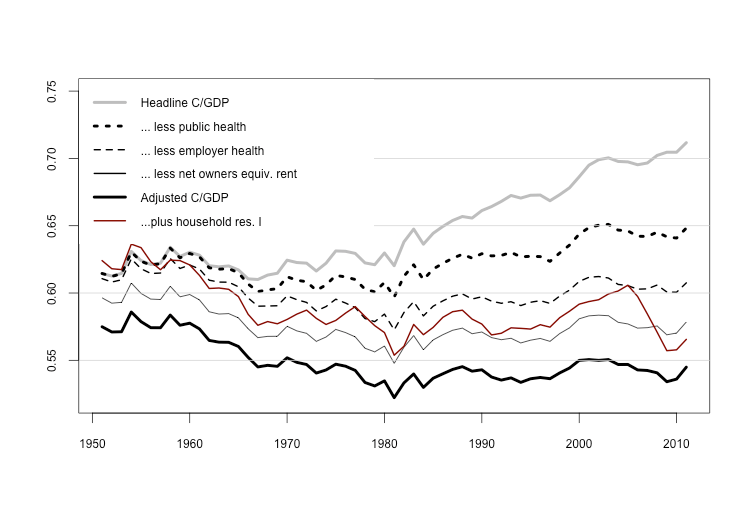 The apparent rise in the consumption share is entirely due to the combination of higher imputed noncash expenditure, such as owners’ equivalent rent; and third party health care spending (mostly Medicare). Both of these expenditure flows are treated as household consumption in the national accounts. But neither involves cash outlays by households, so they cannot affect household balance sheets. Third, household debt is concentrated near the top of the income distribution, not the bottom. Debt-income ratios peak between the 85th and 90th percentiles, with very low ratios in the lower half of the distribution. Most household debt is owed by the top 20 percent by income. Finally, most studies of consumption inequality find that it has risen hand-in-hand with income inequality; it appears that stagnant incomes for most households have simply meant stagnant living standards. To the extent demand has been sustained by “excess” consumption, it was more likely by the top 5 percent. The paper as written is too polemical. I need to make the tone more neutral, tentative, exploratory. But I think the points here are important and have not been sufficiently grappled with by almost anyone claiming a strong link between debt and distribution. The second paper is on state and local debt – I’ve blogged a bit about it here in the past few months. The paper uses budget and balance sheet data from the census of governments to make two main points. First, rising state and local government debt does not imply state and local government budget deficits. higher debt does not imply higher deficits: Debt ratios can also rise either because nominal income growth slows, or because governments are accumulating assets more rapidly. For the state and local sector as a whole, both these latter factors explain more of the rise in debt ratios than does the fiscal balance. (For variation in debt ratios across state governments, nominal income growth is not important, but asset accumulation is.) Second, despite balanced budget requirements, state and local governments do show substantial variation in fiscal balances, with the sector as a whole showing deficits and surpluses up to almost one percent of GDP. But unlike the federal government, the state and local governments accommodate fiscal imbalances entirely by varying the pace of asset accumulation. Credit-market borrowing does not seem to play any role — either in the aggregate or in individual states — in bridging gaps between current expenditure and revenue. I will try to blog some more about both these papers in the coming days. Needless to say, comments are very welcome. My paper with Arjun Jayadev, “The Post-1980 Debt Disinflation: An Exercise in Historical Accounting,” has now been published in the Review of Keynesian Economics. (There is some other stuff that looks interesting in there as well, but unfortunately most of the content is paywalled, a choice I’ve complained to the editors about.) I’ve posted the full article on the articles page on this site. The conventional division of household payment flows between consumption and saving is not suitable for investigating either the causes of changing household debt–income ratios, or the interaction of household debt with aggregate demand. To explain changes in household debt, it is necessary to use an accounting framework that isolates net credit-market flows to the household sector, and that takes account of changes in the debt–income ratio resulting from nominal income growth as well as from new borrowing. To understand the implications of changing household income and expenditure flows for aggregate demand, it is necessary to distinguish expenditures that contribute to demand from expenditures that do not. Applying a conceptually appropriate accounting framework to the historical data reveals that the rise in household leverage over the past 3 decades cannot be understood in terms of increased household borrowing. For both the decade of the 1980s and the full post-1980 period, rising household debt–income ratios are entirely explained by the rise in nominal interest rates relative to nominal income growth. The rise in household debt after 1980 is best thought of as a debt disinflation, analogous to the debt deflation of the 1930s. There’s a common shorthand that makes “debt” and “borrowing” interchangeable. The question of why an economic unit had rising debt over some period, is treated as equivalent to the question of why it was borrowing more over that period, or why its expenditure was higher relative to its income. This is a natural way of talking, but it isn’t really correct. The point of Arjun’s and my paper on debt dynamics was to show that for household debt, borrowing and changes in debt don’t line up well at all. While some periods of rising household leverage — like the housing bubble of the 2000s — were also periods of high household borrowing, only a small part of longer-term changes in household debt can be explained this way. This is because interest, income growth and inflation rates also affect debt-income ratios, and movements in these other variables often swamp any change in household borrowing. We didn’t have anything you could call a deficit problem until 1980. We then saw rising debt under Reagan-Bush; falling debt under Clinton; rising under Bush II; and a sharp rise in the aftermath of the financial crisis. This is not a bipartisan problem of runaway deficits! Note how the terms “deficits” and “rising debt” are used interchangeably; and though the text mostly says deficits, the chart next to this passage shows the ratio of debt to GDP. What we have here is a kind of morality tale where responsible policy — keeping government spending in line with revenues — is rewarded with falling debt; while irresponsible policy — deficits! — gets its just desserts in the form of rising debt ratios. It’s a seductive story, in part because it does have an element of truth. But it’s mostly false, and misleading. More precisely, it’s about one quarter true and three quarters false. Here’s the same graph of federal debt since World War II, showing the annual change in debt ratio (red bars) and the primary deficit (black bars), both measured as a fraction of GDP. (The primary deficit is the difference between spending other than interest payments and revenue; it’s the standard measure of the difference between current expenditure and current revenue.) So what do we see? It is true that the federal government mostly ran primary surpluses from the end of the war until 1980, and more generally, that periods of surpluses were mostly periods of rising debt, and conversely. So it might seem that using “deficits” and “rising debt” interchangeably, while not strictly correct, doesn’t distort the picture in any major way. But it does! Look more carefully at the 1970s and 1980s — the black bars look very similar, don’t they? In fact, deficits under Reagan were hardy larger than under Ford and Carter — a cumulative 6.2 percent of GDP over 1982-1986, compared with 5.6 percent of GDP over 1975-1978. Yet the debt-GDP ratio rose by just a single point (from 24 to 25) in the first episode, but by 8 points (from 32 to 40) in the second. Why did debt increase in the 1980s but not in the 1970s? Because in the 1980s the interest rate on federal debt was well above the economy’s growth rate, while in the 1970s, it was well below it. In that precise sense, if debt is a problem it very much is a bipartisan one; Volcker was the appointee of both Carter and Reagan. Here’s the same data by decades, and for the pre- and post-1980 periods and some politically salient subperiods. 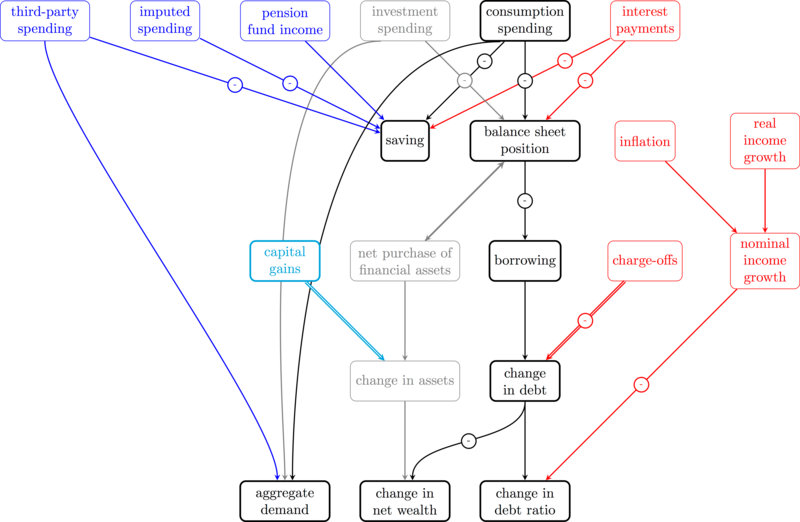 The third column shows the part of debt changes not explained by the primary balance. This corresponds to what Arjun and I call “Fisher dynamics” — the contribution of growth, inflation and interest rates to changes in leverage. [*] The units are percent of GDP. Here again, we see that while the growth of debt looks very different between the 1970s and 1980s, the behavior of deficits does not. 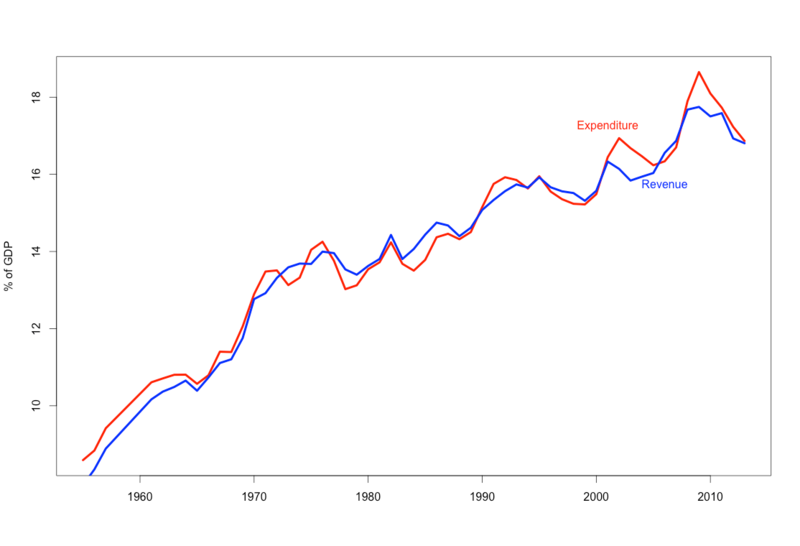 Despite Reagan’s tax cuts and military buildup, the overall relationship between government revenues and expenditures was essentially the same in the two decades. Practically all of the acceleration in debt growth in the 1980s compared with the 1970s is due to higher interest rates and lower inflation. 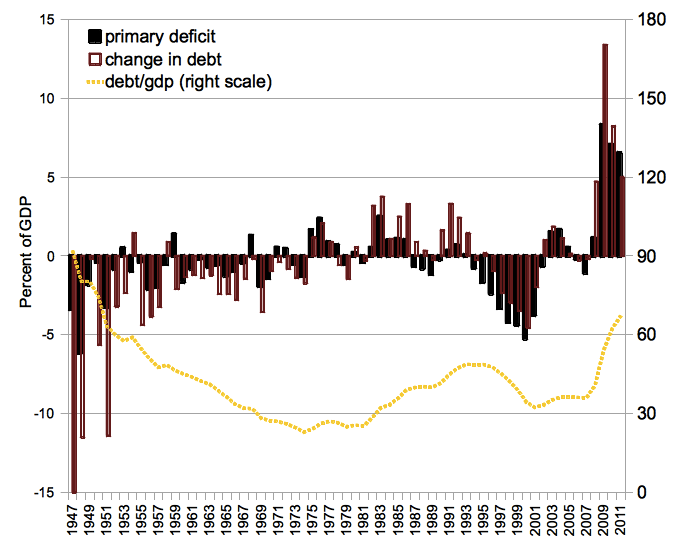 Over the longer run, it is true that there is a shift from primary surpluses before 1980 to primary deficits afterward. (This is different from our finding for households, where borrowing actually fell after 1980.) But the change in fiscal balances is less than 25 percent the change in debt growth. In other words, the shift toward deficit spending, while real, only accounts for a quarter of the change in the trajectory of the federal debt. This is why I said above that the morality-tale version of the rising debt story is a quarter right and three quarters wrong. By the way, this is strikingly consistent with the results of the big IMF study on the evolution of government debt ratios around the world. Looking at 60 episodes of large increases in debt-GDP ratios over the 20th century, they find that only about a third of the average increase is accounted for by primary deficits. For episodes of falling debt, the role of primary surpluses is somewhat larger, especially in Europe, but if we focus on the postwar decades specifically then, again, primary surpluses accounted for only a about a third of the average fall. So while the link between government debt and deficits has been a bit weaker in the US than elsewhere, it’s quite weak in general. So. Why should we care? Most obviously, you should care if you’re worried about government debt. Now maybe you shouldn’t worry. But if you do think debt is a problem, then you are looking in the wrong place if you think holding down government borrowing is the solution. What matters is holding down i – (g + π) — that is, keeping interest rates low relative to growth and inflation. And while higher growth may not be within reach of policy, higher inflation and lower interest rates certainly are. Even if you insist on worrying not just about government debt but about government borrowing, it’s important to note that the cumulative deficits of 2009-2011, at 22 percent of GDP, were exactly equal to the cumulative surpluses over the Clinton years, and only slightly smaller than the cumulative primary surpluses over the whole period 1947-1979. So if for whatever reason you want to keep borrowing down, policies to avoid deep recessions are more important than policies to control spending and raise revenue. On a methodological level, I see reframing the question of the evolution of debt in terms of the independent contributions of primary deficits, growth, inflation and interest rates as part of a larger effort to think about the economy in historical, dynamic terms, rather than in terms of equilibrium. But we’ll save that thought for another time. The important point is that, historically, changes in government borrowing have not been the main factor in the evolution of debt-GDP ratios. Acknowledging that fact should be the price of admission to any serious discussion of fiscal policy. Strictly speaking, debt ratios can change for reasons other than either the primary balance or Fisher dynamics, such as defaults or the effects of exchange rate movements on foreign-currency-denominated debt. But none of these apply to the postwar US. The picture is a bit different from the US, since adverse exchange-rate movements are quite important in many of these episodes. But it remains true that high deficits are the main factor in only a minority of large increases in debt-GDP ratios. I only just realized that this exists. Regular readers of this blog will remember some interesting discussions here a few months ago of the dynamics of public debt. The point — which is taught in any graduate macro course, but seldom emphasized in public debates — is that the change in debt-GDP ratios over time depends not just on government deficits or surpluses, but also on growth, inflation and interest rates. In particular, for the US, the UK and many other countries , the decline in debt/GDP in the postwar decades is entirely due to growth rates in excess of interest rates, with primary surpluses contributing nothing or less than nothing. Sectoral Debt as Share of GDP, 1929-2010. Click to embiggen. So what if you apply the same kind of decomposition to private debt that is done for public debt, and ask how much of the change in sector’s debt in a given period is due to changes in borrowing behavior, and how much is due to changes in interest rates, growth rates, and or inflation? Surprisingly, no one seems to have done this. So Arjun Jayadev and I decided to try it, for household debt specifically, with (IMO) some very interesting results. A preliminary draft of our paper is here. I’ll have more on the content shortly, but if you’re interested please take a look at the paper. We’re in the process of revising it now, and any comments/questions/thoughts on making it better would be most welcome.